Inheriting technology from Sony professional equipment, this lens boasts a precision optical design that supports 4K as well as upcoming high-resolution formats with minimum breathing and image shift. Three control rings offer manual control for demanding large format production, and the first SSM drive in a lens designed for movies contributes to quiet powered zoom. When it comes to E-mount native zoom lenses, few can compete with the Sony 28-135mm Zoom Lens. 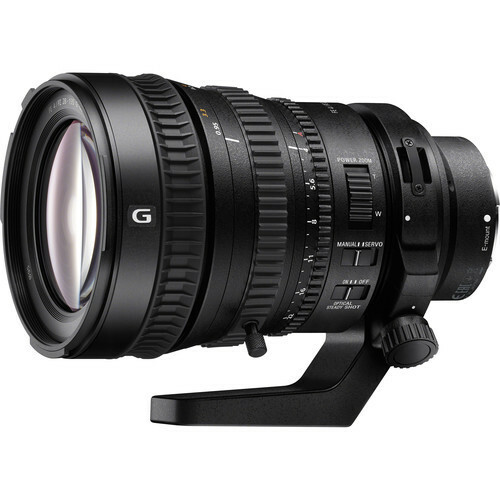 This lens has quick autofocus, covers a wide zoom range, and is sharp from wide to tele. The 28-135 also features an ingenious bit of tech that Sony calls “electronic par focal.” A true parfocal lens holds focus perfectly throughout the zoom range, so that you can always count on being sharp even when punching in for a closeup. But a true parfocal lens is an expensive animal – so Sony simulates it by micro-adjusting the focus of the lens as you zoom to maintain perfect focus. That, plus the built in OSS, make this an excellent partner to the FS7 and a great documentary lens.